We take the safety of our customers extremely seriously and are continuously taking measures to provide the best possible service. We aim to go above and beyond all legal requirements to ensure your comfort and security are a priority at all times. From the moment you request a vehicle to the moment you arrive at your destination, we have your safety in mind. Our text alert system sends you a confirmation text so you know you’re booked in and the details are correct. Once a vehicle is allocated to you an automatic text is sent again to let you know we are on the way. The make, model and registration of the car are provided for safety and peace of mind. This means that if you’re travelling alone you can be secure in the knowledge you’re getting into the right car. Additionally, booking your car via our smartphone app is a great way to be assured of your safety. You can see the make, model and registration of your taxi and can even track the driver on his way to your location. 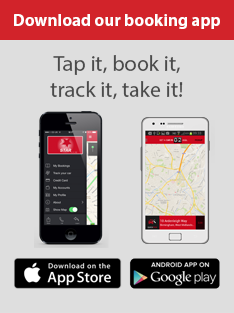 You can find out more about booking via our app right here. Making our area better is so important to us, we believe our values and duty extend beyond enabling people to get around. It’s about celebrating our area and caring about the people in it, being responsible citizens. That’s why we endeavour to follow high standards of practice helping make our streets safer for everyone, whether they are on foot, bike or in cars.